Director – Umberto Lenzi, Screenplay – Francesco Barilli & Massimo D’Avack, Producers – Ovido G. Assonitis & Giorgio C. Rossi, Photography – Riccardo Pallotini, Music – Daniele Patucchi. Production Company – ROAS/Medusa Distribution. English photographer John Bradley goes on a lone expedition up river in northern Thailand, deep into uncharted territory. There he is captured by a native tribe. At first made a prisoner, he finds life brutal and savage but is gradually accepted into the tribe. He takes a native girl Maraya as his wife. They are attacked by a rival cannibal tribe. Maraya’s pregnancy then becomes problematic and Bradley’s only solution is to defy the tribe and take her back to civilisation for treatment. Deep River Savages was the film that inaugurated the late 1970s/early 80s genre of the Italian cannibal film. This is a mini-genre that has developed a considerable notoriety, having produced what are without any doubt some of the most extreme and graphic films ever put on screen. The genre produced the notorious likes of Emanuelle and the Last Cannibals (1977), Last Cannibal World/Jungle Holocaust (1977), Slave of the Cannibal God/Prisoner of the Cannibal God (1978), Cannibal Holocaust (1979), Cannibal Apocalypse/Cannibals in the Streets (1980), director Umberto Lenzi’s own Eaten Alive (1980) and Cannibal Ferox/Make Them Die Slowly (1981), and Zombie Holocaust/Dr Butcher M.D. (1980). Umberto Lenzi directs Deep River Savages with a considerable degree of verisimilitude. The Thai location and travelogue footage looks authentic – there is no doubt that the toothless and unadorned natives are the real deal. Lenzi includes little anthropological snapshots – the bleeding of snake venom and dipping of arrowheads in it to make poison arrows. One has no idea to what extent the film is anthropologically correct or not but it has a ring of authenticity to it. Deep River Savages is also different to watch after seeing many of the other above-mentioned Italian cannibal films. While they deliberately set out to be a catalogue of savageries, this is not Deep River Savages‘ primary intent. Instead, it is mostly concerned with an anthropologically realistic-seeming crosscut of life among the untouched wilderness tribes. 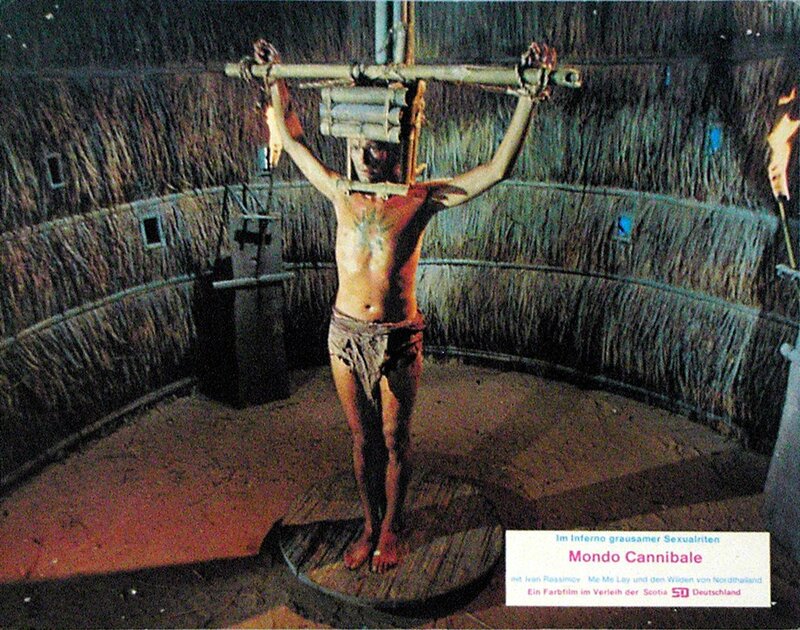 Other Italian cannibal films built in a savage social commentary, contrasting the cannibal tribes with white exploitation and seeing the tribes as coming to devour Westerners for their cruelty and exploitation. None of that travails Deep River Savages, rather it is a placid look at life in a remote native village, where the greatest drama is the romance between white man Ivan Rassimov and native girl Me Me Lai. On the minus side, outside of the romance, there is not much forward momentum to the plot, just the anthropological catalogue of the fascinating, sometimes brutal, life in the village. For all that this film inspired the Italian cannibal genre, there is little actual cannibalism featured in the film – just a brief encounter with an enemy tribe. For that matter, Deep River Savages is not even a horror film, more a cod-anthropological drama about native life that has more in common with something like Nicolas Roeg’s Walkabout (1970). That said, Deep River Savages does not stint when it comes to portraying the savageries of life among uncivilised tribes. These Italian cannibal films are not exactly ASPCA approved and there are some sadistically dwelt-upon scenes with a mongoose being egged on to savage a snake. There is also a nasty pre-Crocodile Hunter (1996-2004) scene of a native wrestling a crocodile and then gutting it while it is still alive. The most stomach-churning scene is one where a monkey is bound inside a table specially built to expose its head and the top of its skull is whacked off with a machete, whereupon the natives invite Ivan Rassimov to join a feast and eat its brains. Umberto Lenzi had a prolific career making low budget films between the 1950s and 90s, working in numerous Italian exploitation genres. His other genre films include:- the superhero film Kriminal (1966); the spy film The Spy Who Loved Flowers (1966); the giallo Orgasmo/Paranoia (1969); the giallo So Beautiful, So Perverse (1969); the giallo An Ideal Place to Kill/Oasis of Fear (1971); the devil worship film Knife of Ice (1972); the giallo Seven Blood-Stained Orchids (1972); the giallo Spasmo (1974); the giallo Eyeball (1975); the cannibal film Eaten Alive/The Emerald Jungle (1980); the zombie film Nightmare City (1980); the cannibal film Cannibal Ferox/Make Them Die Slowly (1981); the sword-and-sorcery film Iron Master (1986); the haunted house film Ghosthouse (1988); the occult film Hell’s Gate (1989); the psycho film Hitcher in the Dark (1989); the slasher film Nightmare Beach (1989); and the occult film Demons 3/Black Demons (1991).